GPSr Units / Does your GPS capitalize the word MILL? If you have a moment, try this and if you get the same thing post what model GPS you're using. Basecamp doesn't do this, so I think it's a recent global change in Garmin firmware. Very strange. Some of you know this has been a pet topic of mine. After lots of trial and error, I have a procedure that I'm pretty happy with so I would like to share it. You will need Globalmapper and either Photoshop or Photoshop Elements (could also be done with GIMP I'm sure). The procedure is pretty straightforward but involves a number of steps that I will summarize below. This tutorial assumes you have some basic knowledge of the NLCD and its color coding scheme, although I will show the exact process that I used. First you need to download the 2006 NLCD imagery, which is one big file covering the entire US. I suggest you crop this down to a very small area for the purpose of experimenting because processing time can be significant with a large file. For example, one USGS 24k quad is about 500x500 pixels and will process pretty quickly. This is what you should initially see in Globalmapper. Right-click the image layer in the Control Center and create area features. This function creates polygons from raster images based on the criteria you specify. I have decided to only extract two things from the image: forest cover and populated areas. I'll leave it up to you to work out similar techniques for extracting other data. Create a layer called forest using the option for selected colors, then choose the colors shown - Palette ID numbers 1, 3, 4, 5 and 8. These are different kinds of vegetation recognized by the NLCD. After completing this, use the following options to extract the populated areas (which I will call "residential") - palette ID numbers 11, 12 and 13. I am also creating a new layer called residential for these. This is what you should now see. Change the Globalmapper background color to black - this will help isolate the colors in Photoshop. Select all objects on the residential layer, specify a custom style with a null border and solid fill of primary red (RGB value of 255,0,0). We will now export the results as a TIFF raster image using the following options. I am up-sampling the image in order to create a smoother final result (anti-aliasing). I find that 50 feet/pixel is a reasonable setting for a 24k map but feel free to try other values. Processing time and file size will increase with higher settings, lower settings may look too "jaggy". Also be sure to save a TFW and PRJ file or you will have a problem opening it in Globalmapper after modifying in Photoshop. Recently I've gotten curious about other vector map formats, and realized that I knew next to nothing about Lowrance. Digging around on their site, they have something very cool - free emulators that you can download for many of their devices. These are like a "virtual gps" that works just like the real thing although they can't be used for navigation. What a great idea - I wish Garmin would offer the same thing. Anyway, I noticed that Globalmapper is able to export vector data in Lowrance's .lcm format so I tried a few tests. Didn't go well at first; when I used the 64 bit version of GM 12 I got an error that some kind of .dll was missing when I tried to export. I had the 32 bit version handy on my Windows tablet, so I made a really simple "map"with only one line object and tried exporting. It seemed to hang for awhile, and when I looked it had created over 1100 files on my desktop where I wanted to save the map! Had to kill GM and delete all the files. Still not ready to give up, I dug around and realized I also had the 32 bit version of GM on my desktop machine. This time it worked like a charm and I was able to install a simple map that contained major roads in my area. It wasn't pretty, but it worked on the emulator. So I tried exporting a full 24k quad from my NJ topo and that also worked fine. Obviously it would take some work to clean this up and make it look good on Lowrance, but really the process was very straightforward. The cool thing is that you can export directly from Globalmapper and it is really fast - no need for cgpsmapper or other software. Anyway, I suspect there are a bunch of people out there who would love free maps for their Lowrance devices. If you want to play around with this, the emulators are available here: http://www.lowrance.com/en-US/Support/Product-Emulators/ I have been playing with the Elite-5 Emulator. To install a map, first find the emulator program folder - C:\Program Files (x86)\Navico\Elite-5 on my Vista system. Create a new folder named Maps0, then copy the .lcm file you exported from Globalmapper there. I suggest that you create a temporary folder somewhere and use it when you export your globalmapper file.... just in case it decides to create thousands of files like it did with my earlier test. I got a Garmin GLO last week and have been putting it through its paces. If you aren't familiar with the GLO, it's a very small GLONASS-enabled bluetooth GPS receiver that sends position data to applications running on a laptop, tablet or phone. While this specific device may not have broad appeal, the GLONASS performance is remarkable. Here's a test I did this morning side by side with my 60csx and Montana sitting stationary at a known location. You can see that the GLO is a completely different kind of device. It appears to have created less points than the other devices, but in fact they're all there, just stacked on top of each other. I don't think I will buy another handheld unless it also has GLONASS. Map Making Support / TypWiz 4 to support multi-color polygon bitmaps? I have always wanted to do this so will be very interested to have a look at TypWiz 4 when it is introduced this spring. Generally speaking I like the National Map better than the old seamless server. But I have found some bugs/anomalies. I have been downloading NED 1/9 arc second data using 24k reference polygons. Some of the downloads result in corrupt zip files ~800kb that can't be opened (a proper download would be in the 50-60MB range). I don't think these are failed downloads, they are just quads for which no data is available. But the data selection dialog claims that 2011 NED 1/9 is available. These are areas where no data was available a couple years ago when I started collecting the NED 1/9, so again it isn't surprising. But you have to go through the whole process of ordering and downloading only to get the little garbage file. Some of the 2011 NED 1/9 is actually available for download, but it's a crapshoot and the only way to find out is the make the download attempt. No big deal, just a small annoyance. I wonder if the 2011 data is actually available but they just haven't put it all online yet? Anyone else see these kind of glitches with the National Map? Some interesting new features and hardware in the Nuvi series, but nothing that gets me very excited. If the specs are correct, it appears they are introducing a 7" device with a resolution of only 480x272. Now let's see what they might have in the handheld department. There have been rumors of new Oregon and Edge models but I haven't seen any specifics. What kinds of projects are other mapmakers planning for the year ahead? Kind of slow getting started, but it has only taken me about 3 days to get a barebones site up and running. Lots of files involved with this... using my settings, about 4,000 map tiles are required for each USGS 24k quad. I might transition this to some other kind of software since I'm not using any of the Google-specific features or maps, just their interface for displaying my own map data. Also have an alpha version of another project which uses the same high-res LIDAR data in .kmz files as a Garmin Custom Map. I have a companion transparent Garmin Vector Map (.img file) containing roads and POI's that can be overlaid on the .kmz. Each USGS quad requires 16 .jpg files so that limits most Garmin handhelds to a total of 6 quads at a time (96 tiles) although the Montana can handle 31 quads. Not sure what else I might tackle this year. I'm interested in a lot of things, but as you know, this stuff takes a lot of time! Happy New Year to all! Using The Maps/Garmin Software / Basecamp support for transparent overlays coming? There seems to be a bug in the current version of Basecamp that can cause the basemap to be displayed at the same time as other maps. In the course of discussing this, one of the Basecamp developers says that adding support for transparent overlays (such as MyTrails) is actually on their "to do list". Just noticed this on Garmin's site. 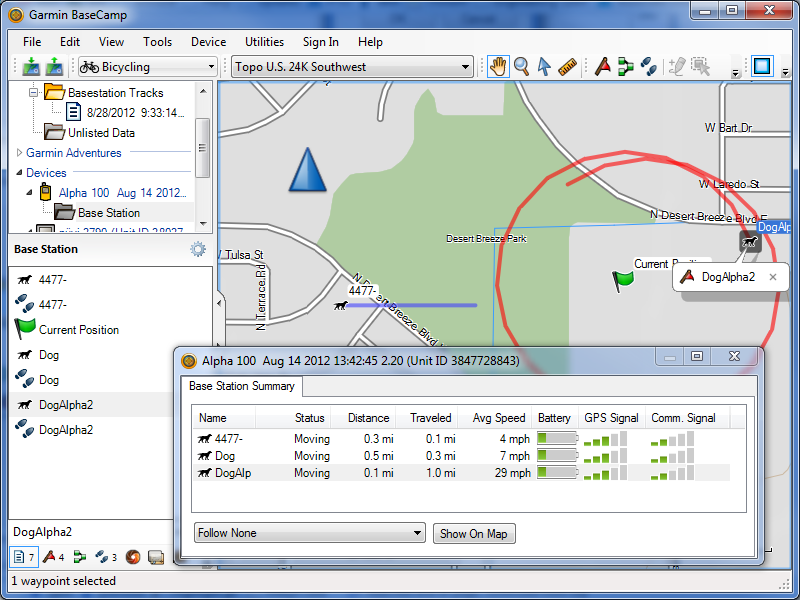 If you have limited bandwidth you can download Garmin Training Center as step one and then MapSource. For quite some time users have reported that this no longer works, due to changes in Training Center. The "trick" relied on the fact that Training Center included a basemap, but I believe that was removed from the package awhile ago. Unless I am missing something here, it sounds like you can send USGS a hard drive, receive it back a month or two later full of data, and the only charge is the shipping. If so, that's pretty cool. Quite a list of available stuff too - like the full DRG dataset (238GB) or the full 1/9 arc second (LIDAR) dataset (2.03 terrabytes) or ful DOQ dataset (16.9 terrabytes). Anybody ever use this service? Made a change so that Topo/Recreational and City Navigator Maps cannot be enabled at the same time. I wonder if we will see this "feature" appear on other devices now? I am really puzzled... is it a response to people who complain they can't see their topo map because City Navigator is hiding it? Or has Garmin decided they don't want anyone "riding their coat tails" and using overlays? I am not sure how they determine if another map is a "Topo/Recreational" one. And I don't intend to install this on my 3790 to find out either.